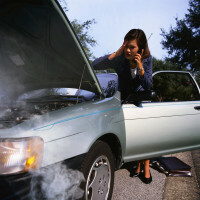 Home » Junk My Car Queens » What Causes Your Car Engine to Overheat? What Causes Your Car Engine to Overheat? There’s nothing scarier when suddenly you noticed that your car’s steam spews from under the hood and the warning light is turning red from your dashboard. Overheating is one serious problem that can be catastrophic and require immediate action, it can damage the engine and may lead to replacement. Fortunately, an overheating car can become a rare occurrence if you are armed with the knowledge of what causes this issue, thus, below are a number of possible reason for your overheating car engine. A leak in your cooling system can cause an engine to overheat because the leak creates a shortage of water or coolant. Air usually enter through the leakage, it will form a large bubble or an airlock that can stop the circulation of the coolant and become super heat. Water pump issue is another factor. It is the most active component that is responsible for maintaining the coolant circulation. It has a bearing or impeller inside that may break over time until the engine overheats. Fan belt works with the fan that produced a cooling air through the radiator when this engine part will be snap or break and fall off the air will not be pushed through your cooling system and you will overheat. Transmission and engine oil is sort of blood that circulates and should run well in the system. Thus, if you find oil in the radiator you have a major problem. Blocked hoses could also be the culprit of an overheating engine, sometimes dirt or road sediment can block the flow of fluid through your hoses. If the system fails it causes engine damage. What Should You Do When This Scenario Occurs? Always bring a safety kit in your car like a tool kit, flashlight, blanket, flashlight and water in case of emergency. Nothing is more frustrating when you found out that your engine is overheating as it will lead to a serious and various problem. If this is happening, call and expert’s or just dial (718) 297- 9797 as we can render the best advice and services to keep your vehicle cool.